A Menu of all Maps of Kyrgyzstan as well neighboring regions and nations. Regular additions and updates !! 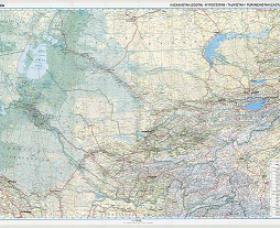 A Menu of all Maps of the Kazakhstan and parts there of, as well as neighboring regions, nations and territories. A Menu of all Maps of Tajikistan as well neighboring regions and nations. A Menu of all Maps of Nepal (Kingdom) as well neighboring regions and nations. 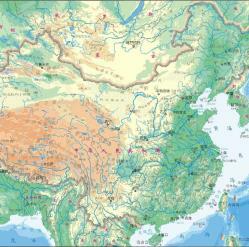 A Menu of all Satellite Image based Maps of Asia and parts there of, available from AsiaReportcom. A Menu of all Maps of the Korea, the Korean Peninsula, North- and South Korea, as well as neighboring regions, nations and territories. A Menu of all Maps of Malaysia (Republic and wider Territories) as wel neighboring regions and nations. A Menu of all Maps of Mongolia (Republic and wider Territories) as wel neighboring regions and nations. A Menu of all Geographical and Political Maps of the continent of Asia and nations, plus neighboring regions (Eurasia, Arabia, etc). Click to Go to the Asia Report Main Menu Map, with Zoom and Scroll Functions. Mouse over the Country of your Interest and get short basic information on each Country. Once more Click through to the Desired Country and Full Information, Photos, Maps and Photo-Virtual Walks of Cities, Towns, Villages, Monuments, Landmarks and Hotspots covered by www.DrBen.Net and www.AsiaReport.com. SITE INFORMATION UNDER EDITING - MAP AVAILABLE NOW !! A Demographic Map depicting the Distribution of the Islamic Faith in China and Asia, as well as Europe and the majority of the continent of Africa. The predominantly Muslim Xinjiang-Uygur Autonomous Region of China, Parts of Gansu Province and Small Ningxia Hui clearly stand out as the main muslim areas in China. An overview Map of the Distribution of Religions in the World. 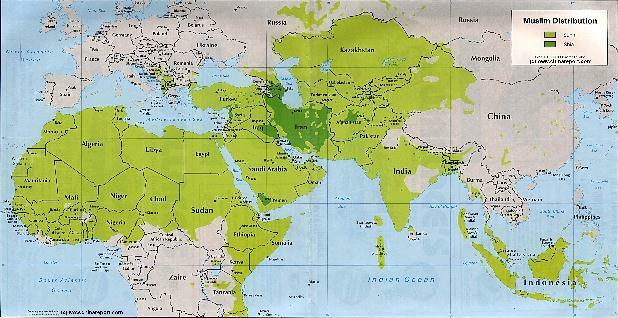 Map includes Major Religions of the World and Sub-Division, as well as local religions and area's of mixed populations. Displayed are the three main sects of Christianity - Roman Catholicism, Protestantism and Eastern Orthodox Christianity, the two main divisions of islam - Sunni and Shia (Sufi is a third), Buddhism - with all varieties including Japanese Shintoism included, Chinese Religions (including the Philosophies of Taoism and Confucianism - these are strictly speaking NOT Religions). Separately mentioned are Hinduism, and Judaism. 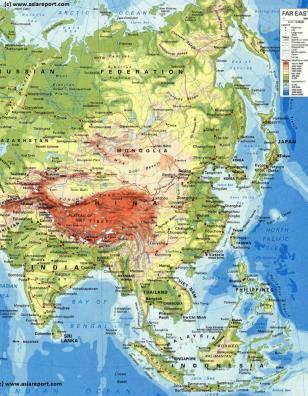 A Geographical overview Map of China and neighboring Nations of Central, East and South-East Asia with National Borders and Capitals. 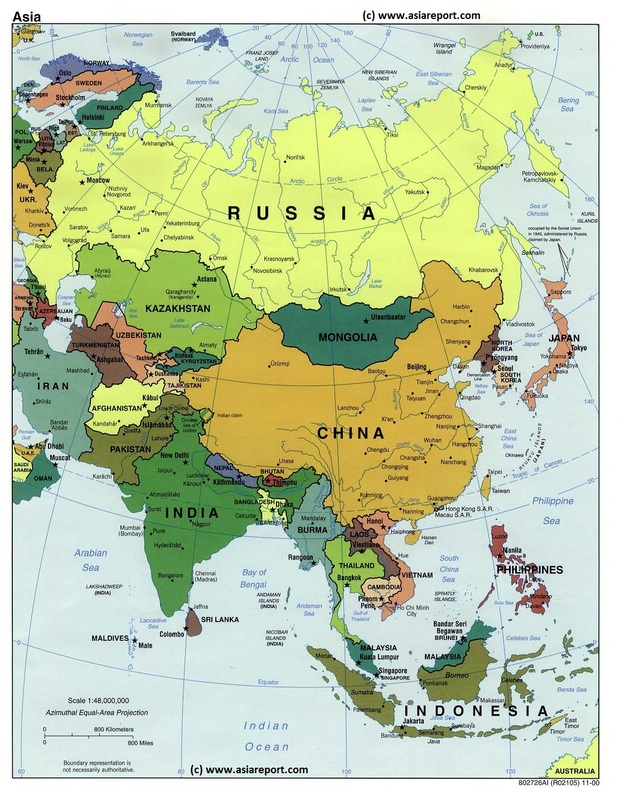 Nations are Vietnam, Laos, Myanmar (Burma), Bhutan, Sikkim, Nepal, India, parts of Pakistan, parts of Afghanistan, Tajikistan, parts of Kyrgystan, parts of Kazakhstan, Eastern parts of Russia (Russian Federation), Republic of Mongolia, North Korea, South Korea, a small part of Japan, and further the South-East Asian Nations of the Philippines, Vietnam, Laos, Cambodia, MyanMar (Burma) and Bangladesh. Map includes names of all Capitals of all 22 Chinese Provinces, Five Autonomous Regions (Inner Mongolia, Ningxia Hui, Guangxi Zhuang, Tibet, Xinjiang Uighur), Two Special Administrative Regions (Hong Kong & Macau) and Four Muncipalities (Beijing, Chongqing, Shanghai, Tianjin). Main Deserts, Mountain ranges, Mountains & Heights, Rivers, Lakes, Sea's and Oceans are marked with their names. A Menu of all Maps of the Peoples Republic of China and neighboring regions and nations. 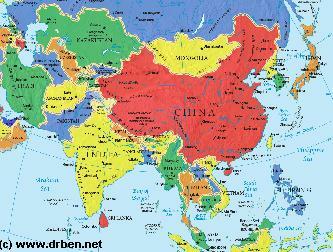 A Menu of all Historical and historically relevant Maps of Asia and parts there of, available from AsiaReportcom. A Geographical overview Map of China and neighboring Nations of Central, East and South-East Asia with National Borders and Capitals. Nations are Bhutan, Nepal, India, parts of Pakistan, parts of Afghanistan, Tajikistan, parts of Uzbekistan, Kyrgystan, parts of Kazakhstan, Eastern parts of Russia, Mongolia, North Korea, South Korea, a small part of Japan, and further the South-East Asian Nations of Vietnam, Laos, Cambodia, Thailand, Myanmar (Bhurma) and Bangladesh. Map includes names of all Capitals of all 22 Chinese Provinces, Five Autonomous Regions (Inner Mongolia, Ningxia Hui, Guangxi Zhuang, Tibet, Xinjiang), Two Special Administrative Regions and Four Muncipalities (Beijing, Chongqing, Shanghai, Tianjin). 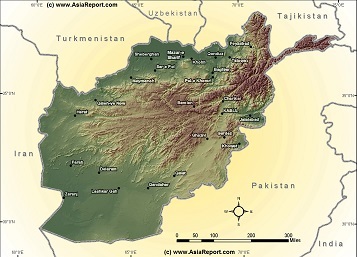 Main Deserts Gobi and Taklamakan, Mountain ranges, Rivers, Lakes, Sea's and Oceans included. 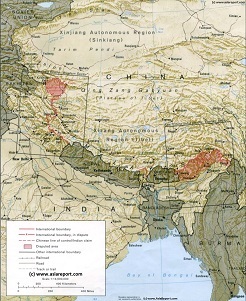 This Map clearly defines disputed borders and territories, Nations (except for Tibet), Provinces and Regions, as well as geographical features such as main mountain ranges, main rivers & lakes of the region, basins and plains, plus the locations and names of main cities, towns, monuments and landmarks. This simplified geographic Map provides a complete overview of Korea and Japan as well as relevant parts of China (P.R.C.) and the Russian Federation. Apart from designating the main regions, islands and cities in Japan, it provides an overview of large parts of north east China (Liaoning and Jilin Provinces as well as the southern parts of Heilongjiang Province) as well as the main population centers and a few of the main rivers within this large territory. The map gives relatively little information on the Korean Peninsula and only a few cities in both North and South Korea are marked on the Map. Barely any information can be glanced from the section of Primorsky Krai Province of the Russian Federation seen in the top center of the image. A simple schematic map overview Map of India depicting the location of the National Capital of (New) Delhi as well as the outlines, name and capital city of each of the states within the Democratic Federation of India as in the year 2014. Since, minor changes have taken place. 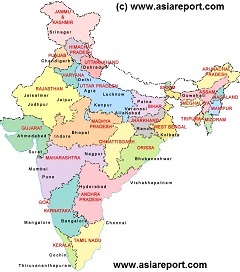 As of June 2, 2014 India has not 28 but 29 States. The latest state added on that date is Telangana, which is composed of the northwestern parts of Andra Pradesh State. As a result the Andrapradesh State is considerably smaller since. The new State of Telangana is the 12th largest State within India today. A Capital for the new Telangana State is yet to be selected (2017). Map includes names of all Provincial Capital cities of Indian Provinces. 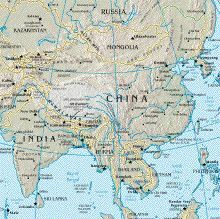 This Schematic Geographic relief Map gives a full overview of the so called Western Section of the border regions between India and China (P.R.C. ), more speciffically the regions included in this map range between the Pakistan occupied parts of Jammu and Kashmir in the west, the South Rim of the Taklamakan Desert (Kashgar and Hotan City Prefectures) and the Kunlun Mountain Range in the north, Ngari Prefecture in T.A.R. of the Chinese occupied Tibet and western parts of Nepal in the west and the Indian National Capital of (New) Delhi in the south. 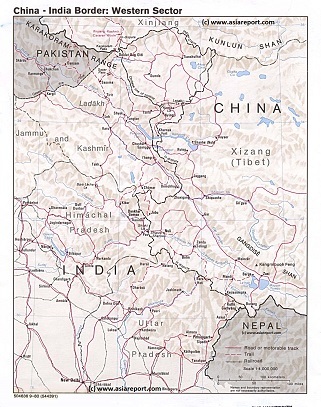 Included parts, territories and regions are; southernmost parts of the Karakoram Mountain Range, Indus River Valley in both Pakistan controlled and India controlled Jammu and Kashmir, Ladakh Region, Aksay Chin disputed region since 1962 controlled by China (P.R.C. ), Kunlun Mountain Range, Parts of the Altyn Tagh Mountains, parts of Ngari Prefecture of Tibet Autonomous Region, China (P.R.C. )., parts of Himachal Pradesh, Uttar Pradesh and Delhi Capital Territory in India. Rivers depicted on this map include: Indus River (in Tibet, Ladakh and Jammu and Kashmir). Today, Chip Chap, Shyok, Spiti, Chandra River, Sutlej River, Yamuna River, Alaknanda, Ganges, Sangge Sangbo River (Chinese: Shiquan He), Gar Zangbo, Xiangquan He and Karnali River in Nepal. Various of the western Tibetan Lakes are also depicted inside the sparsely inhabited but heavily militarized Ngari Prefecture. Browse the Map and link through for more information by location where available. A Menu of all Maps of Russia and the Russian Federation as well neighboring regions and nations. 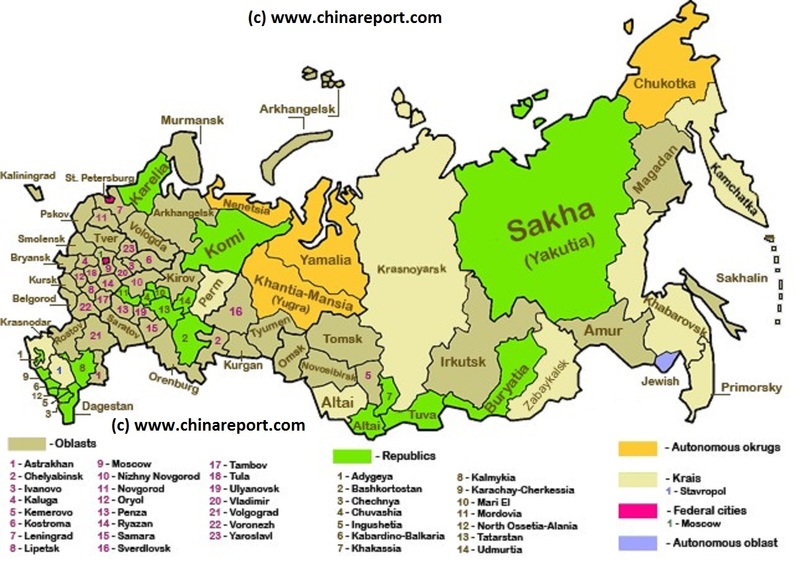 A schematic Map of Russia and the Russian Federation giving an overview of the location, names and relative sizes and shapes of all Russian Federal Territories. Territories are color coded in order to signify nature. Among the territories are Russia; and 46 Oblasts, 21 Republics and 8 Krai's, and additionally 2 Federal Cities (Moscow and St. Petersburg), 1 Autonomous Oblasts and 4 Autonomous Okrug. Not included in this map are territories recently invaded by Russian Forces in northern Georgia (2008 ; Abkhazia and Tskhinvali Region (South Ossetia)) and in Ukraine (February 2014-ongoing), in the latter case primarily The Crimea, which has since 18 March 2014 been (re-) annexed by Russia Proper. A Menu of all available Maps of Taiwan (R.O.C.) as well neighboring regions and nations.